The Bone Wreck, named for the whale skeleton that resides inside it’s hulk, is most likely that of the “Lieut. Sam Mengel”. The Lieut. Sam Mengel was completed on September 5, 1918 and launched in Bath, Maine. 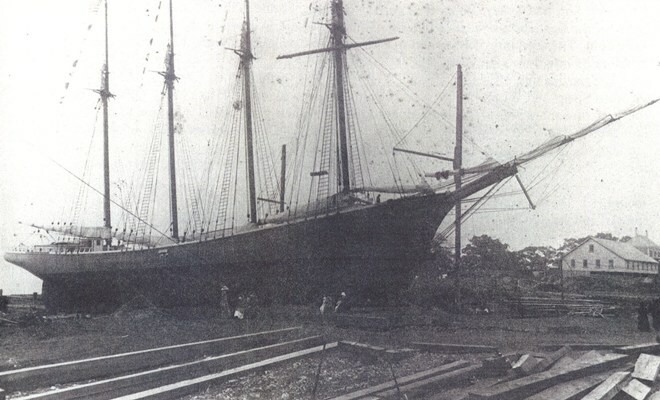 It was a 905 GT, 4-masted wooden schooner built by Percy and Small for the Mengel Box Co. It was used in the West African mahogany trade. She was rigged as a four-masted schooner with a yard and a course on her foremast. In 1933 she was converted to barge and subsequently foundered in a storm off Boston, Massachusetts on October 16, 1935. The wreck was located and dived by Capt. Eric Takakjian and Brian Skerry in the early 1990s. The Bone wreck is very large and comes off the bottom to about 160 ft. It is covered in nets, mostly monofilament netting and gill nets, which make it a very easy wreck to encounter entanglements. It is largely intact and sits upright on the bottom at about 180 fsw. The wreck is most notable for the whale skeleton scattered about, though there are some interesting artifacts to be had, which lends support to the theory that this wreck is the “Mengel”. Most likely, a whale became entrapped in the wreckage and died there. There are large pieces of vertebrae and skeletal remains all about. Hence, the Bone Wreck. Interestingly the Bone wreck sits head-to-head with another wooden hulled wreck. Visibility can be so bad at this site, however, the these 2 wrecks are often confused as one. This is an excellent dive and a beautiful wreck in good visibility, but on average visibility ranges from 5-15 feet. This wreck for advanced technical divers only as the enormous amount of netting on it can be hazardous.